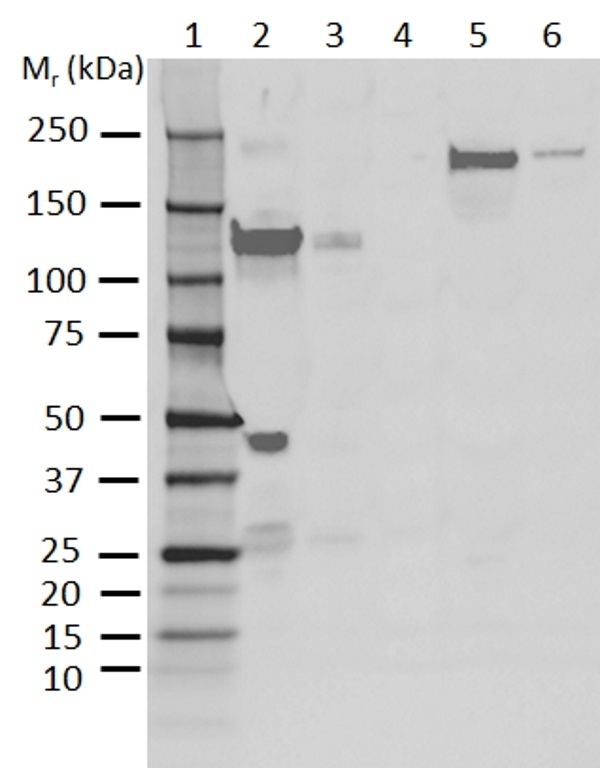 Detection of human C3 was performed using Mouse anti Human C3 (MCA6110) at 0.5 µg/ml followed by Rabbit F(ab’)2 anti Mouse IgG-HRP (STAR13B) at 1:2000. Lane 2 shows the C3 alpha chain at molecular weight of approximately 115 kDa and the C3c alpha chain fragment 2 at approximately 39 kDa. Lane 5 and 6 shows the mature C3 at molecular weight of approximately 186 kDa. Mouse anti Human C3 antibody, clone AB01-384 recognizes complement C3. C3 is a central component of the classical, alternate and lectin pathways in the complement cascade which forms part of the innate immune defenses. The central position of C3 in the cascade has led to the emergence of immune invasion strategies by many human pathogens, including Staphylococcus aureus which expresses 2 proteins that interfere with the activation of C3 (Garcia et al. 2012). C3 Deficiencies in humans also show an increased susceptibility to bacterial infections in early childhood the development of autoimmune disease and kidney diseases (Ricklin et al. 2016). Conversely, complement over-activation can result in various disease pathologies, including induction of inflammatory pathways causing tissue damage. With complements’ role in various diseases, pharmaceutical and biotech companies have targeted the cascade for potential therapeutic targets in a range of immune and inflammatory diseases as well as in transplantation medicine (Ricklin et al. 2012). C3 is activated via its’ cleavage into fragments which have varying functions within the complement cascade.